Your dreams usually incorporate your natural talents. You might notice that your dreams are part of the traits you were created to use. We are all equipped with certain traits that are distinct, unique, or special to us. So part of pursuing our dreams is to put to use our God-given talents. Your dreams can fuel your soul when life begins to feel challenging or discouraging. I have been able to access that little flicker of a dream and hold onto that for light in the dark times. Thinking of my dreams as something that is bigger than just wishful thinking carries some power and motivation. Your dreams become a part of life long learning, growing, and experiencing. It is easy to become stunted or even stale in what we do, know, or even share with others. When we have our eyes on a bigger dream, it keeps us on track to keep growing and finding new insight…becoming. Your dreams keep you focused on a purpose beyond the parenting years. It’s easy in the midst of those days of wiping noses, changing diapers, potty training, disciplining, feeding, chauffeuring, and attending kids’ activities to lose sight of what our lives will look like when they are grown and on their way. I know, I can honestly understand that it is hard to imagine those days! LOL! In fact, we won’t have an empty nest for another 15 years! But I do know that after 20 years of parenting I am finding great reward in those moments that start to occur when you plug into something that fuels a dream. Your dreams and your pursuit of them become an inspiration to your child. It is by our example of expressing our dreams and pursuing them, that our children will learn to do the same. How empowering that is to teach by example! 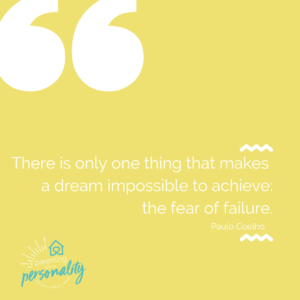 Sometimes we experience some obstacles in pursuing our dreams. What might those obstacles be? Circumstances—location (where you live), available finances, time, energy, resources, etc. These are just a few! But there are several here that I’ve almost caved to many times! What about you? 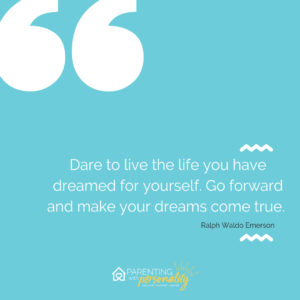 There is often some confusion when you speak about following or pursuing your dreams and parenting. It is almost as though people fear you have to choose one of the other. Those first five years of a child’s life (often spent at home) are such key years for guidance and direction. Then those children start school. Our guidance and direction may change shape, but our jobs are still so vital and important. 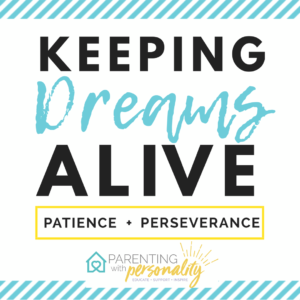 Pursuing your dreams does NOT mean that parenting is not fulfilling enough. It does not mean that it is not fun enough. It does not mean it is not important enough. It does not mean it is not ENOUGH. Our dreams are simply another part of who we are. And I wholly believe that we can do our best parenting when those dreams are alive within us. When those dreams or passions burn within us, we are driven to seek, to grow, to learn, to become. Through this process we model both growth and drive. The ability to see something that may not be quick or easy to accomplish, but something we strive for and are motivated to experience. 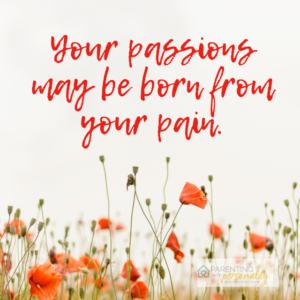 Maybe you are a parent who feels that you’ve lost touch with your dreams or passions. You are not alone. Maybe at one point in life you felt like you were keyed in. Perhaps they have been on the back burner so long that you have a hard time feeling the passion of them anymore. 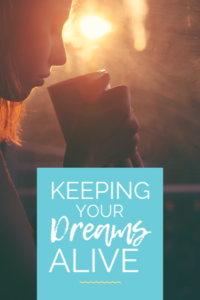 Maybe you feel you have grown through the process of becoming a parent and aren’t quite sure if the same dreams are still your dreams? Those are all understandable thoughts and feelings. So how does a person get back in touch with their dreams, their passions, their interests? Take a strengths assessment. Some people refer to strengths as gifts or talents, others just identify personal strengths. No matter how you think of them, take some time to inventory what you bring to the table. What comes natural to you? I recently did a gift assessment on an app on my phone (Spiritual Gifts Test). You may enjoy a book that explains them all, or you might prefer a quick and easy assessment. No matter which route you choose, this is a great place to start. There are several of these to be found online. Ask the magic wand question. If you could wave a magic wand and have more energy, more time, more financial resources, more…of whatever you feel you are lacking, what would you do? Don’t let these become your limitations. Despite how impossible it feels, decide how you might make small strides in working toward a day where those things are more available. Can you find even thirty minutes in your day or an hour or two in a week to move toward that dream? Can you put aside $10 a week or $25 a month to invest? Can you find ways to boost your energy, improve your diet, or do better self-care to fuel your energy sources? Break down the big dream. Maybe you can’t do, be, or pursue the whole big thing at once. That’s ok, and understandable. Think of smaller ways that you might get to put those gifts or talents to use on a smaller scale, maybe in your child’s school, in your church, in your community, etc. 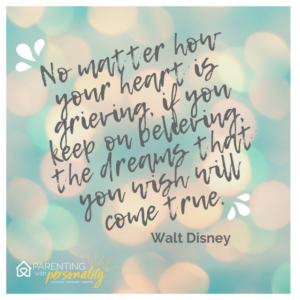 Find ways to keep those dreams alive and growing! Trust me, when I read the email in January of 2007, the thought of attending this conference felt impossible. I would NEVER have the resources available. Did we finally strike it rich? Heavens NO! Did we magically find more time or energy? Heavens NO there too! The timing was finally right. Maybe I would have chosen to experience this sooner. But then again, I have to trust that this was likely the timing that God chose to help bring things together. I had to exercise both patience and persistence. That can be a tough balance, and not one I excel at! I decided to invest. I could have easily sat and waited for the money to magically appear. After all, I didn’t win any money or strike it rich. But I did start doing just a few hours of extra work each work. And with this money that hadn’t once been available, I felt the ability and possibility to invest in my dream. We made some sacrifices. It took a family effort to help support Mom’s dream. My husband especially had to shoulder a bit of a burden in those days I was gone. Let’s be honest…he earns a good dad and husband award for managing six kids alone at home for a week! And my kids also sacrificed having mom available each night to see me invest in a dream. My older kids really pitched in to help the younger ones, and the younger ones were willing to function out of their routine in my absence. And you know what…they were ALL excited to see me pursue this dream. I will never forget their eager waves at the window as I set out on the adventure. I couldn’t have felt more loved and supported. Hearing their excitement as they asked questions, looked at pictures, took phone calls, and face timed from afar…it was an unexplainable gift. No, it wasn’t all fun and games for them or me! It was hard work. It was a sacrifice. It was an investment. AND It was a dream come true! Maybe you are sitting on a dream. Perhaps you have buried a dream. Or maybe you feel you have totally lost the capacity to even dream! Please don’t lose heart. I remember many mothering days, feeling hopeless and unable to dream. Hang on! The time will be right. Keep dreaming. Keep pursuing. Keep on keeping on!! You’ve got this!! Click To Tweet And if you need someone to help you find that dream, message me! I’d love to help ask some questions that would get your heart dreaming again! Let’s make this even easier. I will attach a questionnaire that will help you start getting your dreaming hat on! It will help you take inventory of some questions that relate to your passions and also help you rank some skills. Check out this link, where you get this resource as well as many other helpful resources sent right to your inbox! Now, get busy!! Get dreaming! !